Nashville - August 8 - Al Gore today announced Joseph Lieberman, a well-respected two-term senator from Connecticut, as his vice presidential running mate. Lieberman has been fighting for working families and standing up to special interests throughout a 30-year career in public service. "With pride in his achievements, with gratitude for his willingness to stand with me, and with faith in his fight for working families -- I'm here to announce my running mate, the next vice president of the United States of America, Senator Joseph Lieberman of Connecticut," said Gore. "Together, we're going to take this ticket from Nashville, Tennessee, today, to Los Angeles, California, next week, and in the months and miles ahead, all the way across America to the White House this November." Gore made the announcement at the historic War Memorial/Legislative Plaza located in downtown Nashville. In 1998, he gave his father's eulogy at the same site. Gore's parents met across the street at the old Andrew Jackson coffeehouse, which is no longer standing. In 1992, Gore held his victory rally in the same location. 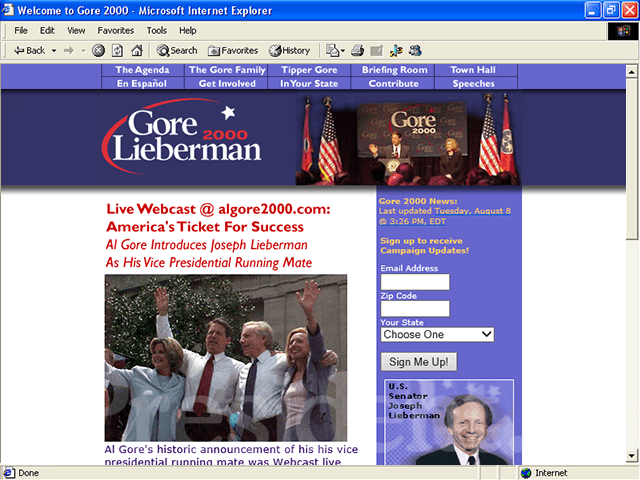 Al and Tipper Gore appeared together with Joe and Hadassah Lieberman. Each spoke after a program that included a performance by Jewel, a multi-award winning singer/songwriter. "Forty years ago I was an 18-year-old who watched in awe as John F. Kennedy became the first Roman Catholic elected to be President. To me, it said a lot, about the courage and character of the American people," said Lieberman. "I think choosing me as his running mate says the same thing about the courage and character of Al Gore. In fact, you could call this ticket the American Dream ticket." Born in Connecticut, Lieberman still lives in New Haven, Conn., with his wife, Hadassah. They have four children: Matthew, age 32; Rebecca, age 31; Ethan, age 24; and Hana, age 12. The Liebermans also have two grandchildren: Willie D. and 3-year-old Tennessee. Lieberman was first elected to the Connecticut State House in 1970, where he served as Majority Leader for six years. From 1982 to 1988, Lieberman was Connecticut's attorney general, where he defended consumers against unfair price-gouging by Big Oil companies. In 1988, Lieberman was elected to the U.S. Senate. He was re-elected to his seat in 1994 with more than 67 percent of the vote. As a member of the Senate, Lieberman has served on the Armed Services, Environment and Public Works and Small Business Committees. He is also the ranking Democratic member of the Government Affairs Committee. Gore and Lieberman formed a close relationship during their years together in the Senate. On his first Friday night in office in early 1989, Lieberman, an orthodox Jew, planned to sleep in the Senate gym in order to avoid driving on the Sabbath. Gore, then a senator, persuaded Lieberman to stay at his parents' nearby apartment. In accordance with the tenets of Orthodox Judaism, Gore turned the apartment lights on and off for Lieberman. * Serving as attorney general of Connecticut in 1986, Lieberman took on Big Oil after evidence of price-gouging came to his attention. He filed a lawsuit against Exxon Corp., Mobil Corp., Texaco Inc., and Sun Oil Co. -- accusing them of violating anti-trust laws by charging retail and wholesale customers different prices for gasoline. In Congress, Gore investigated and fought oil industry price-gouging. Both opposed off-shore oil drilling in environmentally sensitive areas. * Gore and Lieberman would give families up to $6,000 to purchase more fuel-efficient cars, along with other tax breaks for the purchase of energy-efficient pick-up trucks, 18-wheelers, building equipment and homes. Fuel-efficient vehicles will reduce the nation's dependence on foreign oil and help consumers save money at the pump. * Gore and Lieberman fought for the 1996 Welfare Reform Act that has cut welfare rolls in half and helped millions of Americans move from welfare to work. * Gore and Lieberman will fight for a new generation of welfare reform to encourage more responsible fatherhood. They would increase the amount of child support that goes directly to children, help employ "dead-broke" dads and crack down on "deadbeat" dads. * Lieberman voted for the 1993 economic plan that cut deficits and laid the groundwork for the longest period of economic growth in the nation's history. Gore fought hard for this budget and cast the tie-breaking vote that passed it through the Senate. * Gore and Lieberman would maintain fiscal discipline, balancing the budget and completely eliminating the national debt by 2012. They would use interest saved from debt reduction to protect Social Security and strengthen Medicare. * Gore and Lieberman fought for the 1994 Crime Bill and the COPS initiative that have helped bring crime down to its lowest level in 25 years. * Gore and Lieberman would fight for a Victims' Bill of Rights and crack down on crime by putting 50,000 more police officers on the streets and hiring 10,000 more prosecutors in communities across the nation. * Gore and Lieberman have each fought to expand access to quality health care and pass a real Patients' Bill of Rights. * Gore and Lieberman would fight to expand access to quality health care to every child and to millions of adults by 2004. They would fight for a real prescription drug benefit under Medicare and a real Patients' Bill of Rights. * Gore and Lieberman have both been leaders in the fight for campaign finance reform. Lieberman served as the ranking member of the Government Affairs Committee and helped expose the secret donors of "527" groups -- political organizations that kept their big donors hidden from the public. * The McCain-Feingold bill to reform the campaign finance system would be the first bill Gore and Lieberman submit to Congress. * In 1991, Gore and Lieberman were two of only 10 Democratic senators to vote for use of force against Iraq. * Gore and Lieberman would fight to strengthen the nation's military and increase pay and benefits for service men and women. Cotton Ivy, a local humorist opened the program and introduced Ralph Reel, a World War II veteran who led the crowd in the Pledge of Allegiance. Bishop Frederick Talbot of Nashville gave the invocation. Choir High Praise from Nashville's Mt. Zion Baptist Church performed next. Cotton Ivy then introduced multi-award winning singer/songwriter Jewel, who performed two songs. Al and Tipper Gore walked on stage with Joe and Hadassah Lieberman. Tipper Gore gave opening remarks and introduced Hadassah Lieberman. Tipper Gore then introduced her husband, Al Gore. Al Gore gave remarks and introduced his running mate, Joe Lieberman.